(TAIPEI, TAIWAN, 04.06, 2009) -Taiwan Commate Computer Inc.(COMMELL), the worldwide leader of Industrial Mini-ITX mainboard, introduced the Mini-ITX LV-67A that mainboard incorporates an Intel LGA775 pin-out compatible with Intel Core 2 Quad processor Q9400, Intel Core 2 Duo processors E8400, E7400, E6400 and E4300, Intel Dual-Core processors E5300 and E2160, and Intel Celeron processor 440 @ 1333/1066/800 MHz System Bus, The LV-67A platform based on Q45 Express chipset, is ideal for developing high-performance systems for industrial control and automation, retail and hospitality, gaming, print imaging, digital signage, digital surveillance and network security applications. The LV-67A mainboard has a built-in Intel Graphics Accelerator 4500 to deliver an excellent blend of graphics performance and features, Delivers integrated dual-display support and support for Microsoft DirectX 10 and OpenGL 2.0 enabling support for the highest levels of Windows Vista experience. The Graphic Memory Controller Hub incorporates an updated backbone architecture that optimizes available bandwidth with the 1333 MHz system bus. The platform also provides Digital Video Interface support with up to 2048x1536 resolution. The mainboard also supports Intel Matrix Storage Technology(MST), provides quicker access to applications and data files with RAID 0 and 10, and greater data protection against a hard disk drive failure with RAID 1,5, and 10. CPU: Intel Core 2 Quad/Core 2 Duo/Celeron processors @ FSB 800/1066/1333 MHz by the LGA775 socket pin-out. Memory: 2 x DDR3 800/1066 MHz DIMM up to 4.0GB. Chipset: Intel Q45 & ICH10DO. VGA Interface: Intel integrated extreme GMA 4500 technology. LVDS: Optional 18/24-bit dual channel LVDS . LAN: 2 x Intel 82574L Giga LAN. Serial ATA: Support 6 x SATAII interface up to 300MB/s transfer rate. Support RAID 0, 1, 5, 10 and Intel Matrix Storage Technology. Audio: Integrated ICH10DO with Realtek ALC888 HD Audio. I/O Ports: 3 x RS232 and 1 x RS232/422/485 Serial Ports, 8 x USB2.0 ports, 1 x DB15 VGA port, 1 x PS/2 keyboard and mouse ports. 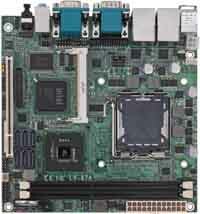 Extended Interface: One PCI slot, 1 x Mini-PCI socket. WatchDog Timer: 256-level generates system reset programmable watchdog timer.